Windshield Washer Fluid Poisoning is the accidental or intentional intake of windshield washer fluids. What is Windshield Washer Fluid Poisoning? What are the Causes of Windshield Washer Fluid Poisoning? What are the Signs and Symptoms of Windshield Washer Fluid Poisoning? The signs and symptoms of Windshield Washer Fluid Poisoning can vary from one individual to another. It may be mild in some and severe in others. Several systems of the body may be affected. The poisoning may occur due to swallowing of the compound, or breathing-in of windshield washer fluid fumes and vapors. Note: Symptoms are observed only after a few hours, in many cases. Initial presentations may include vomiting, stomach pain, and an upset stomach. This is followed by confused behavior, sleepiness, and drowsiness. How is First Aid administered for Windshield Washer Fluid Poisoning? Who should administer First Aid for Windshield Washer Fluid Poisoning? 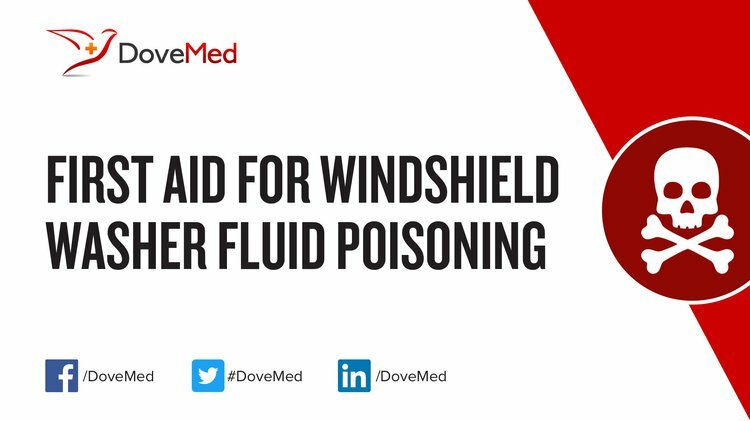 First aid for Windshield Washer Fluid Poisoning is administered by healthcare professionals. What is the Prognosis of Windshield Washer Fluid Poisoning? How can Windshield Washer Fluid Poisoning be Prevented? Reddy, N. J., Sudini, M., & Lewis, L. D. (2010). Delayed neurological sequelae from ethylene glycol, diethylene glycol and methanol poisonings. Clinical toxicology, 48(10), 967-973. Schwake, D. O., Alum, A., & Abbaszadegan, M. (2015). Automobile windshield washer fluid: A potential source of transmission for Legionella. Science of the Total Environment, 526, 271-277. White, S. R., & Kosnik, J. (2014). Toxic alcohols. Marx: Rosen’s Emergency Medicine: Concepts and Clinical Practice. Jun, C., Xue, Y., Liu, R., & Wang, M. (2011). Study on the toxic interaction of methanol, ethanol and propanol against the bovine hemoglobin (BHb) on molecular level. Spectrochimica Acta Part A: Molecular and Biomolecular Spectroscopy, 79(5), 1406-1410. Izdepski, E. J., & Stone, M. J. (2013). U.S. Patent No. 8,542,108. Washington, DC: U.S. Patent and Trademark Office. Dinh, T. V., Kim, S. Y., Son, Y. S., Choi, I. Y., Park, S. R., Sunwoo, Y., & Kim, J. C. (2015). Emission characteristics of VOCs emitted from consumer and commercial products and their ozone formation potential. Environmental science and pollution research international, 22(12), 9345. Jarwani, B. S., Motiani, P., Divetia, R., & Thakkar, G. (2012). Rare combination of bilateral putaminal necrosis, optic neuritis, and polyneuropathy in a case of acute methanol intoxication among patients met with hooch tragedy in Gujarat, India. Journal of emergencies, trauma, and shock, 5(4), 356.